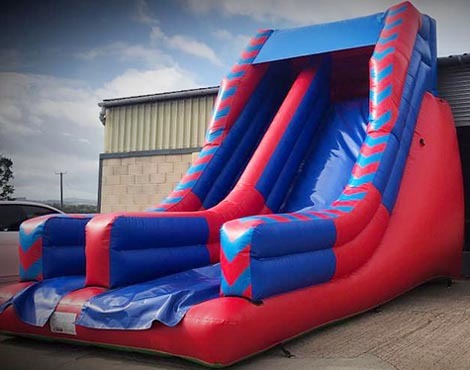 Inflatable Assault Courses provide something different to a standard Bouncy Castle and we have versions for children and adults that are perfect for parties, fun days, fetes and team building. 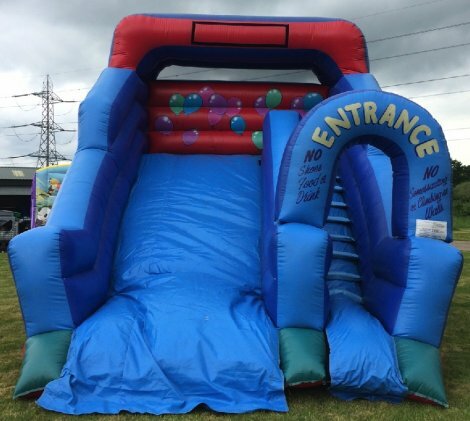 The participants race through the Inflatable Obstacle Courses in pairs so you have a high turnover of users which means everyone gets more than enough goes at parties and makes this type of inflatable very profitable at fun days and fetes. 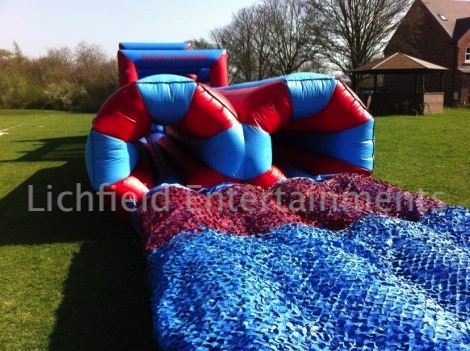 Below is the Big Challenge Inflatable Assault Course which is available as a 43ft assault course in its standard form or 70ft with the inflatable tunnels extension or 95ft with both tunnels and scramble net extensions or 120ft with the addition of the tyre run. If that's not long enough for you the assault courses can be extended further still with the addition of twin flip over walls - see video below. On this Inflatable Assault Course the participants go up the ramp, through two rows of biff bash, wriggle under or between the mangle bars, through the portholes, up the scramble net to the top of the slide and down the other side. The optional extensions are a pair of inflatable side-by-side tunnels that the participants have to crawl through on their hands and knees before reaching the main part. There's also an inflatable bed with a net over the top that the participants have to wriggle under and along that can be placed as the first, second, or third part of the assault course making it almost 100ft long. This inflatable requires an overall operating area of 52x16ft and height clearance of 14ft in its standard form or 80x18ft with the tunnels extension or 105x18ft long with both extensions. This inflatable is suitable for children aged 5 - 14 years. We also now have a stronger but almost identical version of the Big Challenge that is suitable for both children and adults. The 'All Ages' version is available in either the 70ft, 95ft, or 120ft versions formats and again the knock over flip walls can be added to make it longer still. After many requests we added inflatable assault courses suitable and strong enough for use by adults. An almost identical design to the kids Big Challenge assault course it has slightly higher walls to ensure that it meets the BS EN14960 standards for use by adult size participants. 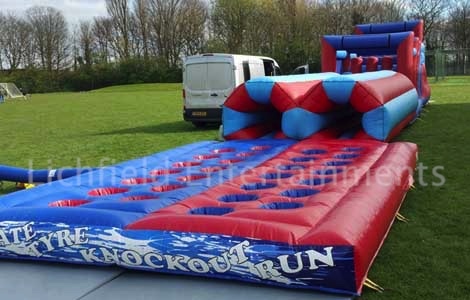 This adult inflatable assault course is available in either 70ft, 95ft, or 120ft lengths and this can be extended further with the brilliant knock over walls. The first slide pictured below is our brand new, all ages 12ft platform Mega Slide. Under that is is an 8ft platform slide with balloon themed artwork that's suitable for kids up to age 14. The above Mega Slide requires an overall operating area of 38x25ft. It comes with supervising staff as standard. The above 8ft platform slide requires an overall operating area of 25x30ft. The slide is supplied with a staff member as standard. If you have any queries, questions, or would like to book one of our inflatable assault courses for your event please call us on the number below or click to enquire and we will do all we can to help.